Like the 2012 Assembly elections, SAD president Sukhbir Singh Badal’s micro-management won the Delhi Sikh Gurdwara Management Committee (DSGMC) election for his party and has paved the way for making him the community’s trans-country leader. The SAD (Delhi) leadership failed to understand the impact of Sukhbir’s micro-management and that proved their undoing, sources said. Unlike the old Akali leadership that relied on sentiment to win elections, Sukhbir brought in a dedicated team from Punjab, gave his men specific duties and made inroads into the homes of the Sikh electorate. This strategy has borne fruit with SAD recording a landslide victory. Sukhbir has been trying to build a national image for himself for quite some time and the DSGMC victory will give him just the platform needed to realise his ultimate goal of bringing the entire Sikh community under the SAD banner, sources said. The win also serves an immediate goal -- it will give SAD an advantage in the forthcoming Delhi Assembly elections as well as launch the party in states such as Uttar Pradesh and Madhya Pradesh having a large Sikh population. 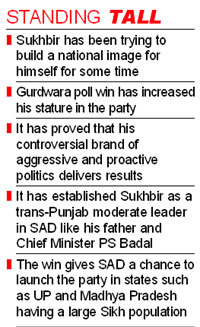 The election has also established Sukhbir as the tallest moderate leader in the SAD after his father and Punjab Chief Minister Parkash Singh Badal. The SAD president, who is at times compared to a company’s chief executive officer, has also shown his mettle in handling religious affairs by venturing into the DSGMC poll arena and emerging victorious. Sukhbir’s hold on the SAD is also complete. He has delivered back to back victories for the party, which began with the 2007 Assembly election and improved his score considerably. His latest victory in the DSGMC elections in the face of Congress opposition has increased his stature in the party and proved that his brand of aggressive and proactive politics delivers results. The party will also be charged up for the February 23 Moga bypoll, as the DSGMC win will have a psychological impact on its workers. In direct contrast, Punjab Congress workers are likely to be dejected, especially since state chief Capt Amarinder Singh had wholeheartedly supported Sarna and even campaigned for SAD (Delhi).